Keeping yourself well-fed and sated is of great importance when you are on an RV vacation. You can survive on restaurant food, but that is neither healthy nor economical. Cooking meals in an RV kitchen is not really an enjoyable experience, mainly due to the chronic lack of space. But still, with proper RV meal planning, you can cook up some delicious meals with a minimum of fuss. Cooking is a very resource-intensive process. It has been so since the dawn of time. And when you are cooking in an RV, you need water and electricity. Most campgrounds have these facilities. If you know your camping schedule in advance, your planning becomes that much simpler. With access to electricity, you can easily cook meals using the oven in your RV kitchen. Another fantastic option is to buy an electric Instant Pot. It is a very versatile utensil capable of preparing a wide range of tasty meals with the minimum of fuss. 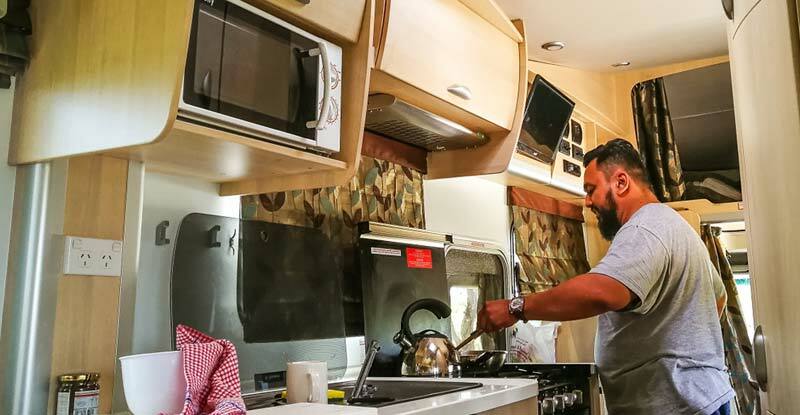 With access to campground hookups, cooking inside an RV is not that different from cooking at home. The process takes roughly the same time, once you get used to the smaller work area. You can whip up full meals with ease in these situations. The only problem is the cleanup, which takes longer with the increased quantity of food. This is where the water comes in handy. If you do not have access to campground hookups, you can still use the generator to power your microwave oven. Now, please remember that this process is not available on all RVs. Some have it as an easy to use feature involving the press of a button, while other RVs need some fairly complicated steps to hook the generator to your kitchen power lines. If you are boondocking, you can always try a hand at outdoor cooking over a bonfire. If you want, stews and grills are all viable options here. It is also much more comfortable than cooking in the cramped RV kitchen. In fact, one of the main challenges of RV meal planning is the proper execution of grocery shopping. The main problem is the obvious lack of storage space for your supplies. Due to this limitation, you have to be very strategic when preparing your grocery shopping list. Depending on the size of your RV you might have weekly plan trips to the supermarket. Modern RV kitchens are usually very well stocked and equipped with the basic appliances. These include a good sized fridge, stove, oven, and microwave. Countertop space might be at a premium, especially if you have a smaller trailer. All things taken into account, your RV kitchen is like a miniature version of your home kitchen these days. So using your RV kitchen should not be that much different from your regular kitchen. Along with the lack of space, the RV kitchen also suffers from power limitations. You may not be able to run the oven or fridge continuously. So you need to plan your shopping based on these limitations as well to get most out of your RV kitchen without any significant wastage. Always keep in mind the expiry dates on ingredients inside your RV kitchen. Before you start the journey, package everything properly, with detailed labels for expiry dates. You can save cooking times by preparing detailed meal plans in advance. Use the list of available ingredients and their use by dates to avoid waste. You can even group and store ingredients together according to the recipes of your planned meals. Start with the pantry when you are stocking your RV kitchen before the journey. Focus on durable foods that do not require refrigeration first. If you have any favorites that you would love to have on the road, don't forget to bring them along. You may not find them in the supermarkets that you visit during the journey. When stocking up, plan for all three major meals as well as the occasional snack. The freezer and fridge inside the RV cannot be 100% relied upon since they are primarily at the mercy of electrical hookups at campsites. If you cannot find a hookup for some reason, your perishable foods might be in for a rough time. So keep the storage temperature requirements in mind when buying supplies. At least 80% of the supplies should be foods that can survive in warm temperatures. If you are a carnivore and want to extend the life of your favorite cuts of meat in the freezer, keep a re-freezable ice pack in your freezer. This will extend the cold temperatures inside your freezer when there are no electrical hookups around. To avoid wasting money, only buy cheese, yogurt, and meat products when you are guaranteed to have access to electricity. Veggies like cabbage, onions, potatoes, and romaine lettuce can survive without refrigeration. But the same cannot be said about cherry tomatoes, spring lettuce, squashes, and melons. So pick the hardy, durable veggies and fruits when possible. If you have the budget, consider installing a high-quality generator inside your RV. You can then hook it to your freezer and fridge to keep your meats and veggies cold and safe. Cheaper options include using ice packs and small coolers as a backup. 6. How to make the plan? Your meal planning is inseparably linked to your RV journey schedule. As already noted, if you are staying put in a campground, cooking meals is much easier. But regardless of your journey status, some meals are always easy to prepare. Breakfast is often the best example. Oatmeal and cereals are incredibly easy to cook, whether you are mobile or stationary. You can cook such meals well in advance and keep them refrigerated overnight, in mason jars. Or you can prep stuff like oats and dry fruits and store them in Ziploc bags. In the morning all that is required is to cook them quickly in the microwave. For heavier meals involving protein, you do have some leeway as far as planning is concerned. Grains can be prepped in advance for quick cooking. Portions of meat and tofu can be precooked and refrigerated. These should last for over a week when stored properly. But as we have already explained, food storage on an RV freezer or refrigerator is not very reliable. So try not to plan precooked meals for the entire week in advance. Only keep them around for a few days at most, that too when you have guaranteed access to electric hookups. The best option is to keep things simple. Do not try to include a wide variety of dishes and ingredients. Using same or similar ingredients will make the whole process or shopping, storing, and cooking meals much easier. The best options are simple stuff like cereals, eggs, oatmeal, dry fruits, and nuts. Pancakes are another good choice, though they can take some extra time to prep. Stovetop is the most reliable cooking option in an RV. So for heavier meals, try dishes that you can cook easily on a cooktop. Some suggestions are pasta with cheese and red sauce, simple mac and cheese, salads and sandwiches, or vegetable stew. You can try hot dogs, burgers, or frozen pizza for dinner. Other options include burritos, guacamole and chips, nachos, and other veggie dishes. Fruits are definitely the best option here. They are easy to prepare, and extremely healthy too. But you can also indulge yourself with the odd dose of chips and popcorn, just as long as you don't overdo it. When boondocking, you have no access to power or hookups. This is the time to try your hand at more rustic modes of cooking. Grilling is a fantastic option, and fun for the whole family as well. One reliable option, of course, is that propane cooktop. If you plan well, you can easily cook meals without breaking a sweat even if you don't have access to power. This meal provides a reliable source of proteins and carbs. And since the ingredients are non-perishable, you don't have to worry about the storage as well. You can substitute rice with healthier alternatives like millet or quinoa if you want. Beans can be pre-cooked, or you can open a can as well. You can also add a healthy dose of toppings, sliced vegetables, or hot sauce. Veggies and salad greens are perishable, so you should take care when stocking up on those. But fresh salad is easy to prepare and incredibly healthy as well. Try to incorporate more durable hearty vegetables instead of the fragile leafy greens if possible. If you have access to refrigeration, you can prepare the salad in advance and freeze it. This is a super quick meal. All that is required is corn tortillas and a microwave. Get them warmed up, and slather some salt, lemon, sriracha, and slices of avocado for a very filling meal. You can also use toasted whole grain bread instead of tacos. This is the easiest category to handle. You don't need too much cooking time, and they are also very healthy and does not contain too much carbs or gluten. Ideally, half your meal should comprise of veggies. And by veggies, we do not mean the starchy ones like potatoes, peas, and corn. The recommended portion of lean protein in your daily meals in 3-4 ounces. This can be anything from chicken, to lean beef and fish. Carbs get an awful rep, and it is easy to binge on them. Rice, pasta, and whole grain bread are all examples. As long as you manage to take them in moderation, they are an excellent choice for RV means. Olive oil, nuts, flax seeds, chia seeds and fish are all sources of healthy omega 3 fatty acids. These should be included in your diet as often as possible. By jazz, we mean the seasoning, spices, and sauces that add some magic and zing to your meals. These are largely dependent on your personal tastes and preferences. Just make sure that you buy stuff that is organic and does not contain significant quantities of processed goods.